I hate Spring. It’s true. Yes, it’s finally warmer weather, yes beautiful, tasty, wonderful spring veggies are finally available, yes it’s the end of the semester, and yes the trees are leafing and the flowers are blooming and the world carries and sweet green sheen. But it’s that last part that gets me. I have really bad allergies. I didn’t realize I had allergies until my freshman year of college. I enrolled in a plant ecology class, tromped around happily for two months looking at leaf bud scars on leafless trees and evergreen shrubs and then wham March and April hit. All of a sudden going outside gave me the shivvers. In between sneezes and I wheezed in breath, unable to get a good gulp of air in. I had it bad. The past couple of years have been better, and I thought this season was going peachy until Saturday morning. See, Saturday morning I decided to snag some double-wide, super tall bookshelves off of Craigslist. Somewhere between the highest pollen count of the season and the dusty bookshelves and then going to work in the bookstore for five hours I lost it. It being all sense of normal human condition. I fully intended to post a recipe Saturday, but I was having a hard enough time looking presentable for customers. Then yesterday I had a rather high fever and didn’t really do much of anything besides watch hour after hour of The Wire (my newest TV on DVD addiction). Needless to say, no recipe posting. Today I’m feeling better, although not 100%. And you know what can make someone feel 100%? Tea and cookies of course! 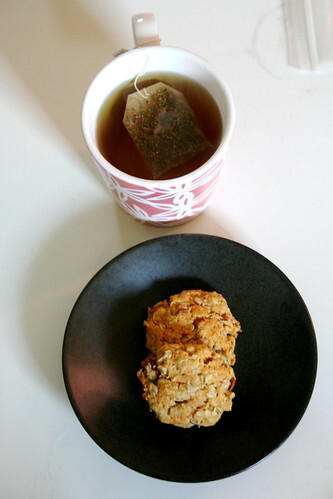 I managed to find one bag of Traditional Medicinals Gypsy Cold Care tea (one of my faves) lurking in the back corner of my cupboard, hurray!, and then I remembered I had carrots and coconut oil so I could make Heidi’s Carrot Oatmeal Cookies. Well, it turns out that I didn’t have enough of most of the ingredients, so I played around the recipe a bit. The end result was just as crack-a-licious as my Pumpkin Oatmeal Chocolate Chip cookies. I love that the recipe isn’t too sweet (one of my least favorite things about most cookie recipes is too much sugar) and the coconuty, salty, sweet, nutty flavor is waaay too addicting (I’m on my 3rd cookie already). Plus the recipe produces a manageable amount of dough, which is a good thing for my 1 person household. The great thing about this recipe, which Heidi pointed out, is that it’s so happy to be played with. You can add in or substitute almost anything. And there is nothing better than the aromatics of melting coconut oil. In a large bowl whisk together the flour, baking powder, salt, and oats. Add the nuts and carrots. In a separate smaller bowl use a whisk to combine the brown sugar, coconut oil, and ginger. Add this to the flour mixture and stir until just combined. Oh, I hope you’re feeling better, Jes. Gypsy Cold Care works for me, too, when I’m not up to par. Those carrot-oatmeal-coconut cookies should make you feel better! I have to give those Jamaican Veggie Patties a try – they sound superb! that stinks that you have such horrible allergies! and i can’t fault ya for downright hating a season ’cause i hate summer! ahahahaha! (it’s just too damn hot for me!) i’m totally going to have to try your take on heidi’s carrot oatmeal coconut cookies. i love everything about ‘em, especially that they’re not too sweet! perfect! I will commiserate with you on the allergies. At least where I live, everyone suffers so we all look and feel together. Tea and cookies will always make you feel better! Oh no! Atlanta allergies are the pits! It seems to get worse every year, if that’s possible. Maybe bc Spring comes slightly earlier lately? Be sure to avoid the chamomile tea. All part of the ragweed family and high high high dose on vitamin C- like 2-3000 mg 3 x day. As for the muffins- those look delicious. Going sub in a gluten-free flour instead of the wheat and honey in place of the sugar. Yummy! Sorry about the allergies – but thanks for the cookie recipe. Good grief, I didn’t know you could get a fever from allergies! I hope you’re feeling better fast! How terrible. I’ve been dealing with chronic sinus infections & allergies might be part of the problem…want some cortizone? Ha! Ah, I feel so lucky that I don’t have such allergies… But my mom does, so I know what a pain it can be! Hope you can enjoy the season to the best of your abilities though… It’s so nice to finally see flowers and such again! And I may just have some shredded carrot waiting for a purpose in the fridge, so these cookies couldn’t have come at a better time. Bookmarked! pollen time is crazy isn’t it? hope u feel better soon! ugh allergies. tell me about it. i am ridiculously allergic to pollen. have you tried an allergy pill regimen? i know it’s annoying to take pills every day but it really helps me. especially because i am around cats a lot too, and i’m way allergic to them as well. awesome looking cookies! the combination of carrots and oats sounds awesome. okay, firstly, I hope you feel better soon! that sounds argh-filled and sneezy, and yeah spring has ways of sucking, it’s true. i must make those cookies! !